Beginning as an importer of shells into the UK in 1833, Shell expanded into oil, energy and petrochemical companies by the end of the 19th century, and now operates in more than 70 countries. The company revolutionised the bulk transportation of oil, dramatically increasing volume and reducing cost for rapidly industrialising countries. Every day, Shell produces the equivalent of 3.1 million barrels of oil. With such a large operation, Shell makes road safety a priority for staff and contractors through company-wide road safety standards and proactive driver safety programmes. Shell also works in partnership with Global Road Safety Partnership, and others, to help set industry standards, as well as to pool skills and resources. Shell works in communities around the world to implement road safety programmes and reduce the rate of road related injury and fatalities. Shell is committed to road safety education for children and their families, to engaging with young and novice drivers, in the provision of professional driver training for staff and 3rd parties, and with a range of innovative programmes bringing road safety messages to the public. Shell and GRSP also work in partnership in the development and implementation of the ‘Safe to School – Safe to Home‘ project which is now in various stages of implementation in more than 15 countries around the globe. Shell’s road safety programmes for local adults and schoolchildren help to address challenges around road accidents and fatalities in many different locations. 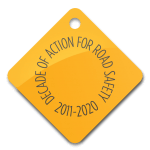 These programmes are based on the advice provided by Shell’s dedicated road safety team. Some of our road safety programmes aim to improve adult driver behaviour by, for example, encouraging seat belt use. Others are designed for children, increasing their road awareness and teaching them to follow simple safety rules. In some places, we support improvements to road infrastructure in local communities by, for example, introducing speed bumps, road signs and street lighting to help prevent accidents.